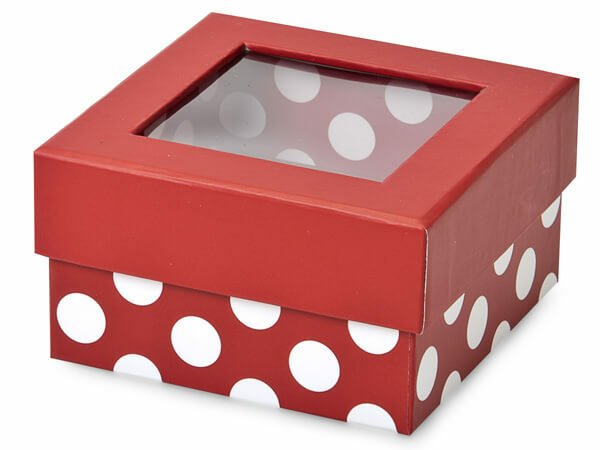 These small square, red polka dot 2 piece boxes are sold in bulk. Rigid cardboard make them sturdy enough to hold heavy items. The base of the box has a white dot on a red background and the lid is a solid red. They have a window in the lid that make them perfect for displaying your gourmet food and gifts. Inside dimensions of the box are: 3.5" L x 3.5" W x 2" H.
Gourmet rigid window boxes are two piece premium quality boxes that feature a clear acetate window. Boxes are available in petite, medium and x-large sizes and have printed interiors. Boxes are sold by size in bulk cartons. These boxes make beautiful gift boxes and are great for gourmet candies and food!